Somehow, after being in the RF business for four decades, I have to admit to not being familiar with the term 'acceptance angle' for antennas. That is after having read scores of articles on antennas. Maybe I did and just don't remember - embarrassing. Acceptance angle is mentioned and explained in this article during the description of rhombic antenna characteristics versus dipoles and multi-element designs. 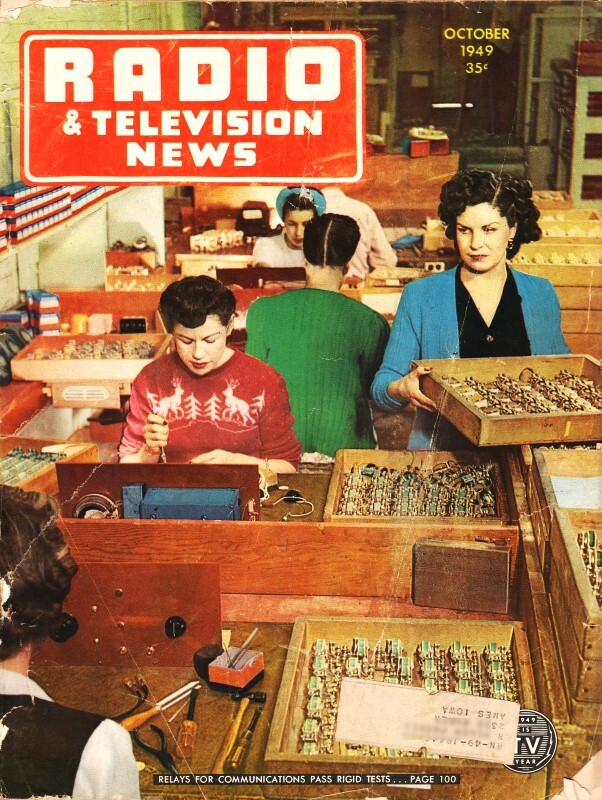 Although the author focuses on television installations, information provided on signal reflections, shadowing, ghosting, multipath, etc., is applicable to radio as well. For fringe and bad ghost areas the rhombic antenna will always outperform an ordinary dipole array. 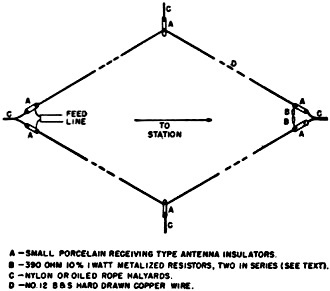 The rhombic antenna has for many years been a favorite for high-frequency sky-wave transmission and reception. This is explained by its simplicity of construction as compared to dipole arrays having comparable gain, by its broadband characteristics, and by its sharp, unidirectional directivity pattern throughout its broad frequency range. 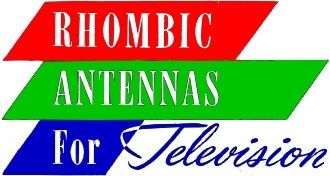 The same characteristics which recommend the rhombic array for high­frequency sky-wave applications make it an ideal TV receiving antenna for use in fringe areas or bad ghost areas when sufficient room for erection is available, particularly when several stations lie in very nearly the same direction. 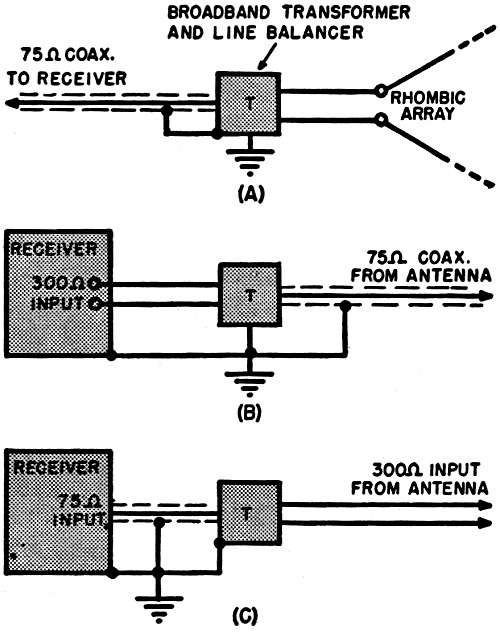 Even when the desired stations do not lie in approximately the same direction, the rhombic array often will be found useful in providing a usable picture on one channel at distances so great that an ordinary dipole array will not perform, or in providing a useful picture on one channel in mountainous areas where ghosts are so bad that a ghost-free picture cannot be obtained on even one channel with an ordinary dipole array. Unlike an ordinary dipole array using one or more parasitic elements, a rhombic array exhibits a good front-to-back ratio over a wide frequency range and also has a very narrow acceptance angle off the front side. This means good rejection of ghost-producing reflected signals on all channels, both from the side and off the back. The wide acceptance angle of conventional dipole arrays makes them highly vulnerable to ghost-producing echo signals arriving obliquely from the front side. Contrary to widespread belief, ghosts are not necessarily produced by echo signals arriving from the back side of an antenna; they often arrive from the front. Front side echo signals sometimes are not apparent as ghosts, because they may have a comparatively short delay time. Under such conditions a separate image is not discernible; the echo signal simply degrades the definition of the picture without producing a separate image. A high-frequency rhombic array may be designed for effective sky­wave transmission or reception over a frequency range as great as 4 to 1. While the vertical angle of maximum radiation or response of such a rhombic increases considerably with decreasing frequency over such a wide frequency range, higher angles become effective as the frequency is lowered. Therefore, the change in vertical directivity is not particularly objectionable for sky-wave applications. The situation is different, however, in the case of TV reception or other v.h.f. ground wave applications. The only effective vertical angle is that of the angular elevation of the horizon at a point where the arriving wave passes over it. There is only one useful vertical angle, and this angle does not change with frequency. The only useful gain is that which occurs at this angle. As a result, the useful frequency range of a rhombic array designed for TV reception or other v.h.f. applications does not exceed approximately 2 to 1, and preferably the range should not exceed 1.6 to 1. This means that it is not possible to design a rhombic array which will provide near-optimum performance on both the low and high television bands. The ratio of 216 mc. to 54 mc. is 4 to 1, and any attempt to cover this range with a single rhombic array will result in mediocre performance over much of the range. Where two-band coverage is re­quired, a high-band rhombic can be strung inside a low-band job from the same poles. The separation will be sufficient to avoid undesirable interaction. For short runs separate feed lines and a suitable switch should be employed. For long runs a d.p.d.t. 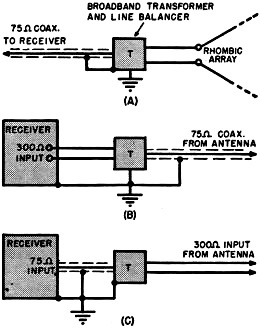 relay can be placed at the antenna end and a single line run from the relay to the set. For an excellent DX FM receiving antenna, simply double the dimension s given in Fig. 1 for the high TV band. Design data are given in Fig. 1 for four rhombics: (1) a long-leg rhombic for use on the low band for maximum gain and directivity where space permits; (2) a short-leg rhombic for use on the low band when space restrictions will not permit a long-leg rhombic or where less horizontal directivity is desired due to a slight spread in the station directions; (3) a long-leg rhombic for use on the high band for maximum gain and directivity; and (4) a short-leg rhombic for use on the high band when less directivity is desired or when it is desired to hang the array from a single pole and two cross arms, or from two poles and a spreader. The latter array is small enough to be mounted on an amateur beam antenna rotator. The long-leg rhombics are four wavelengths on a side at their "design center" frequency, have a gain of approximately 10 db. * over a matched half-wave dipole (varying slightly over the band), have a useful beam width or acceptance angle of approximately 8 degrees (varying slightly over the band), and exhibit excellent ghost rejection (azimuthal discrimination) throughout their frequency range. The short-leg rhombics are two wavelengths on a side at their "design center" frequency, have a gain of approximately 7 db. * over a matched half-wave dipole (varying slightly over the band), have a useful beam width or acceptance angle of approximately 13 degrees (varying slightly over the band), and exhibit good ghost rejection (azimuthal discrimination) throughout their frequency range. 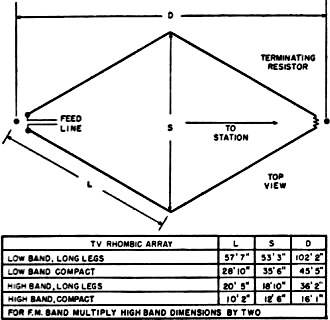 The low-band arrays employ 68 mc. as a design center, and the high band arrays employ 194 mc. as a design center. *When comparing gain figures, keep in mind that the high gains claimed by some antenna manufacturers in their advertising are highly optimistic." A very elaborate dipole array is required for a gain of more than 10 db. over a single matched dipole, and the gain of such an array falls off at a comparatively rapid rate for departures from the design frequency. Fig. 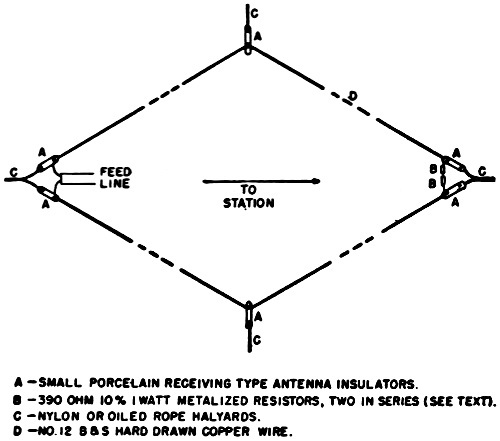 1 - Rhombic antenna design characteristics. As a measure of vulnerability to ghosts, the common figure of merit for ordinary dipole arrays having a wide acceptance angle is the "front-to-back ratio" on each of the channels under consideration. For an array having an acceptance angle of only a few degrees, however, we are interested in the relative response in all directions outside the main lobe, regardless of whether it is off the back or off the front. For this reason, "azimuthal discrimination" is a more appropriate term than "front-to-back ratio" when referring to a rhombic array. Like almost all large, high-gain arrays, a rhombic array exhibits various "minor lobes," and it is the ratio of the amplitude of the main lobe to that of the various minor lobes that determines vulnerability to ghosts. (See Fig. 4.) Generally speaking, as the legs of a rhombic are increased in length and the included angles are maintained at optimum values, the minor lobes become more numerous, sharper, and lower in amplitude (compared to the amplitude of the main lobe). Strictly speaking the response of a large rhombic to a signal whose modulation envelope changes very rapidly with time, such as a television video signal, is not quite the same as for a steady carrier or a signal containing only low modulating frequencies. The effect is insignificant for a wave arriving "head on," because a wave propagated from the fore end to the aft end of the rhombic via the wires travels not more than about one wavelength farther than the direct distance between these two points, and even on Channel 2 this difference is only about 18 feet. For television signals arriving obliquely or from the back the effect is no longer insignificant, particularly in the case of a long-leg rhombic cut for the low band. However, the effective azimuthal discrimination will compare closely to that which obtains under unmodulated conditions and, for practical purposes, may be considered to be the same as for an unmodulated signal. It should be pointed out, however, that if an attempt is made with a low-band, long-leg rhombic to receive a nearby TV station off the back side, the picture quality will be poor even though the received signal (due to the transmitter proximity) is of good strength. If a rhombic array is placed well above surrounding objects it is not necessary to "probe" the available area for an optimum location. This is explained by the sharp directivity pattern (making the array rather insensitive to phasing reflections from nearby surrounding objects) and by the fact that the rhombic is spread over a considerable area as measured in terms of wavelength. While the exact location of the array is not critical, so long as it is "in the clear," the direction in which the array is to be pointed must be determined very precisely, particularly for the long-leg jobs. It is for this reason that dimensions for still longer legs are not given in Fig. 1. While even greater gains may be obtained, the beam width becomes embarrassingly narrow, making the array difficult to orient. However, if you are sure you can get the array "dead on" and want to pick up another 2 db., here are the dimensions for legs six wavelengths long at the "design center" frequencies: Low band - L, 86' 5"; S, 64' 7"; D, 160' 2". High band - L, 30' 7"; S, 22' 11"; D, 56' 8". Fig. 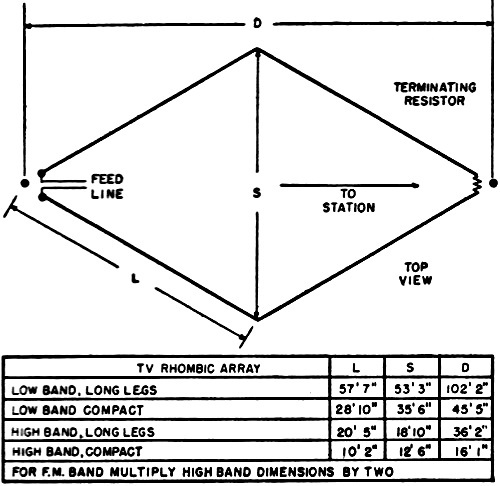 2 - Rhombic antenna construction details. If the transmitter is on a peak which can be located with a pair of glasses: or a telescope, the problem of orientation is still simpler. The orientation of the short-leg rhombics of Fig. 1 should not be off more than about three degrees and that of the long-leg rhombics of Fig. 1 more than about two degrees if maximum performance is to be obtained. In open, flat, or rolling country, the higher the array the better (within the range of practical pole heights) but there is not much profit in going above about thirty feet for the high-band rhombics or more than about sixty feet for the low-band rhombics unless it is necessary in order to get the array well in the clear with regard to surrounding objects, particularly objects in front of the antenna. The law of diminishing returns applies, and it is up to the individual how much pole expense is justified. The higher the antenna the better, but the higher the antenna the less difference another ten foot length makes, and the harder it becomes to obtain another 10 feet. When the receiving location is in comparatively flat country but is separated from the transmitter by a range of mountains or high hills some distance away, in such a manner that the angular elevation of the horizon in the transmitter direction is more than about three degrees on the high band or more than about ten degrees on the low band, then one must be careful not to get too much height. Under such conditions the height at which maximum signal strength occurs (and above which it falls off) will come within the range of practical pole heights, and high poles may provide too much height. If the angular elevation of the horizon exceeds the above limits, it is a good idea to lower the array on the poles a few feet to see if the signal strength drops off. If it increases instead, then the array should be run up and down the poles to find the optimum height. When the angular elevation of the horizon in the direction of the transmitter exceeds approximately eight degrees for a long-leg rhombic or approximately twelve degrees for a short-leg rhombic, it also is a good idea to try elongating the array by increasing the dimension D of Fig. 1 a certain small percentage while checking signal strength, dimension S being decreased accordingly to allow for the elongation. (Elongation raises the elevation angle of the main lobe.) In installations where the angular elevation of the horizon exceeds the aforementioned limits, the distance between the fore and aft poles should be made about fifteen or twenty per­cent greater than the distance D given in Fig. 1, to allow for experimental elongation of the array. When sufficient room to permit experimental elongation of the array is not available, the array should be tipped upwards so that an extended line through the fore and aft apices of the array would intersect the horizon. This requires that the front pole be higher than the center poles and that the rear pole be lower than the center poles (assuming level ground). The array must be kept in a flat plane, even though it is tipped upwards. Because of the sharp vertical directivity of the array, one of these two expedients is required for maximum performance whenever the angular elevation of the horizon exceeds the aforementioned limits. The dimensions given in Fig. 1 are for maximum response at zero elevation with the array lying in a horizontal plane. Therefore, for good response at an angle much above zero, the array must be either elongated or tipped upwards. Elongation gives slightly better results and is the preferred arrangement. When the array is to be located in hilly country or down in a canyon, it is not safe to orient the array in azimuth simply by aiming it at the transmitter. The dominant signal may be taking a devious route. The safest procedure under these circumstances is as follows. Using four low, temporary poles and some willing assistants, determine from which compass direction the main signal is arriving. During this operation keep the S and D dimensions nailed down by tying strong string between opposite apices. After the signal direction is determined, layout the location of the permanent poles, allowing for experimental elongation of the D dimension if there is room. Then proceed as before, checking to see if greater signal strength can be obtained by lowering the antenna. If so, optimize the height and then try either elongating the array in the D dimension or tipping the front of the array upwards, as previously described. This may sound as though a lot of trouble were being taken, but it is necessary in a hilly receiving location in order to insure maximum performance. By following this procedure good pictures have been received in what were considered "impossible" locations. Occasionally when the terrain is very hilly and the spurious reflections very bad, the discrimination of a rhombic is not sufficient to eliminate a ghost coming in on a minor lobe. If this is the case, try varying the D dimension slightly either way (at the expense of the S dimension). The numerous nulls can be steered over a narrow arc in this manner, and usually one can be lined up on the troublesome ghost without affecting the main signal. For proper operation a rhombic array must be terminated in a substantially non-reactive resistance of approximately 800 ohms. Satisfactory operation will be obtained simply by connecting in series two 390 ohm metalized resistors of the insulated, hermetically sealed type (such as an IRC type BTA), shown in Fig. 2. Two in series are preferable to a single resistor having twice the resistance, for reasons which need not be discussed here. Care should be taken to make sure that the resistors used are not of the wirewound type. In the low resistance range, 1 watt resistors are available in both metalized and wirewound types, and the two cannot be told apart by inspection except by type number. If in doubt, break one open to see. Only about 10 per-cent loss in signal voltage will result if a rhombic array is fed directly into a 300 ohm line without benefit of a matching transformer. Therefore, while it is possible to construct a matching arrangement which will result in a precise match, the improvement hardly can be considered worth the trouble. If the feed line must pass through a region of high ambient noise, and it is desired to employ 75 ohm coax for lead-in, it can be done with the aid of one or two of the broadband 300/75 ohm balanced-to-unbalanced transformers now on the market (as manufactured by The Workshop Associates and the J. W. Miller Mfg. Co.) A transformer is connected between the line and the array as shown at Fig. 3A. The device should be made water-tight or protected from the weather. If the receiver does not have provision for 75 ohm input, another transformer should be employed at the set end of the line, as shown at Fig. 3B. At Fig. 3C is shown how 300 ohm ribbon or an open wire line may be employed with a set having only 75 ohm unbalanced input (such as certain receivers employing the Du Mont "Inputuner"). Fig. 3 - Three applications of a broadband impedance transformer and line balancer (T) in conjunction with a rhombic antenna installation. The device is used at the antenna end (A) to permit use of a coaxial line in locations where the line must run through a region of high ambient noise. It is employed at the set end (B) to match coaxial line to a receiver having only 300-ohm input. At (C) it is used at the set end to match 300-ohm ribbon or an open-wire line to a receiver having only 70- to 75-ohm input. Where difficulty is experienced with 300 ohm ribbon close to the ocean becoming very lossy after a few weeks, or where it is necessary to run 1000 feet or more of line to put the antenna in the clear (as in some mountain locations), line losses can be reduced greatly by substituting an ordinary open wire line constructed of No. 14 or No. 12 copper wire spaced two inches. Suitable line spacers are available at radio parts stores. Fig. 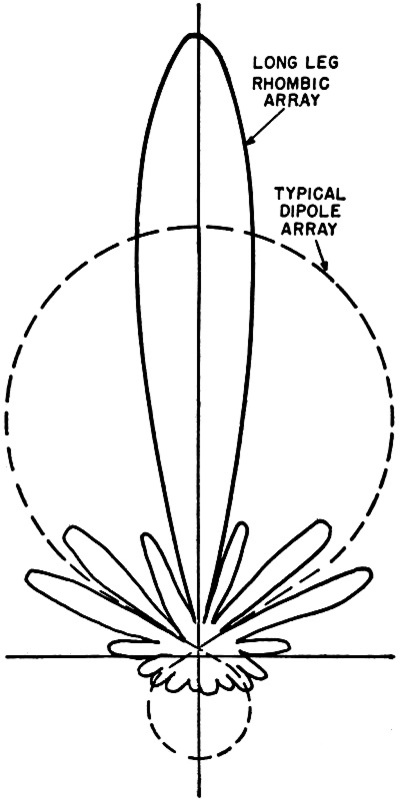 4 - Horizontal directivity and gain pattern (voltage across 300 ohms) of a typical long-leg rhombic array and of a typical stacked dipole array using parasitic reflectors cut to the channel. The rhombic will maintain substantially the same gain and discrimination over considerable frequency range. The dipole array will not. An open wire line constructed as above will have a surge impedance of from 450 to 500 ohms, or somewhat above the standard 300 ohm receiver input impedance. However, this is nothing to worry about, because as the impedance of the line is raised, and the match becomes worse at the set end, the match improves at the antenna end of the line. As a result, it is possible to employ a 450-500 ohm line without running into transmission line ghosts, loss of picture detail, or increased loss due to impedance mismatch. Two examples of the improvement to be expected over 300 ohm ribbon used under unfavorable conditions can be cited. Substituting an open line for 160 feet of ribbon exposed to beach weather for four months resulted in an increase on two low band channels of more than 10 db. After six months the performance of the open wire line had not deteriorated enough to notice. In another case an. open line was substituted for 1100 feet of 300 ohm ribbon newly installed and not providing adequate signal strength. The location was not near the ocean. The measured increase in signal at the receiver on Channel 5 was approximately 12 db. (measured in dry weather), a very worthwhile gain. Wet weather proved to have little effect upon the performance of the open line, which is more than could be said for the ribbon line. It should be kept in mind, however, that for a comparatively short run not near the ocean, ribbon or tubular 300 ohm line is entirely satisfactory. Where noise pickup by the line is not a serious problem, the same order of improvement will be obtained with an open wire line on the high band when the installation is near the ocean or the run is very long. When expense must be kept down, plastic curlers of the type sold for use with home permanent wave kits may be used for spacers. Get the clear ones rather than the colored. Somewhat more care must be taken with an open wire line to avoid sharp bends and to keep the line away from objects as much as possible. Nylon cord or fish line may be used to support and position the line where necessary. The feed line in any case should leave the antenna symmetrically for at least six feet on the high band or at least fifteen feet on the low band before making a bend to the right or left. Contrary to popular belief, little if any reduction in noise pickup will be realized by twisting or transposing the line. It is recommended that wood poles be used to support the array unless they are spaced several feet from the apices. Guy wires should be well broken up where they run within a few feet of the antenna, or else rope guys should be used. All joints should be soldered.